How to Tidy-Up Diagrams with Sweeper and Magnet? Current: How to Tidy-Up Diagrams with Sweeper and Magnet? When you need to insert/ remove a diagram element between two diagram elements, you may find it annoying and time-consuming to move model elements one by one and to keep the layout neatly. With sweeper and magnet, you can increase the space or narrow the space between the diagram elements respectively. Furthermore, you can insert or remove diagram elements easily while maintaining the layout. Create a new project. You can create a project by selecting Project > New... from the application toolbar. Create a business process diagram. Select Diagram > New from the application toolbar. 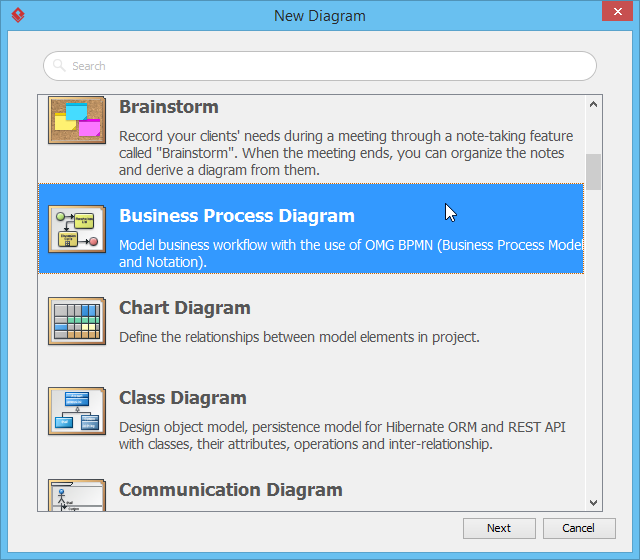 Select Business Process Diagram in the New Diagram window and click Next. Click OK to confirm creation. Now, let's add shapes in between the two tasks by using Sweeper. 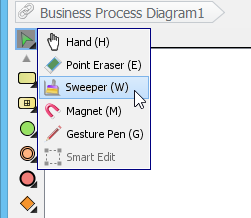 Select the Sweeper tool from the diagram toolbar. Press the space between the two tasks. Hold the mouse button and drag towards the right hand side to create more space. Release the mouse button to complete the action. Now, you have enough room for creating shapes. To edit the existing flow by introducing new shapes, you can delete the flow and re-draw the new shapes. Alternatively, use the split resource to split a flow with new shapes. In this section we will show you how to use the split resource. Move the mouse pointer over the sequence flow connector to show the split resource. Click on the split resource. Select the type of shape to create. In this case, select Gateway. Name the gateway Is Order Valid? and press Enter to confirm editing. Complete the diagram by creating other shapes. When complete, there may be redundant spaces between shapes. Use magnet to remove that space. 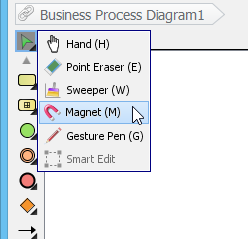 Select the Magnet tool from the diagram toolbar. Press on the redundant space. Hold the mouse button and drag towards the left hand side to remove the space.